Scones are a love of mine. They’re great with my morning coffee, and make a great afternoon snack. Most scone recipes involve quite a lot of butter, but this recipe is an exception. It comes from one of my favorite cookbooks, Veganomicon (page 224), and has very little oil in it. I am not a vegan, but I do enjoy experimenting with vegan cooking. Veganomicon has so many interesting and creative recipes, and has helped me expand my culinary horizons. One of the things I also love about this recipe is that it gives me yet another way to use overripe bananas that never fail to make an appearance on my kitchen counter. I buy bananas with the intention of eating them that way, but they always beat me to the punch and get too ripe. Even a few spots make a banana unappealing to me. I almost never waste them, though, and use them to make banana bread, muffins, scones, or pancakes. 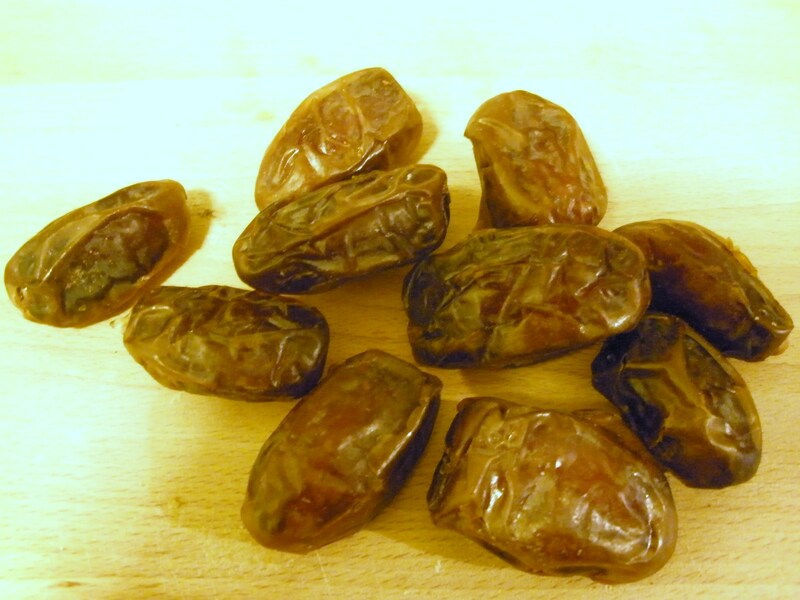 I also love, love, LOVE dates and walnuts, and aromatic spices like cinnamon and nutmeg. If you want a natural air freshener for your home, just bake something containing those spices. I enjoy making a batch of scones and freezing them. That way, I can pull them out one at a time and microwave them for breakfast. I made some changes to the original recipe. 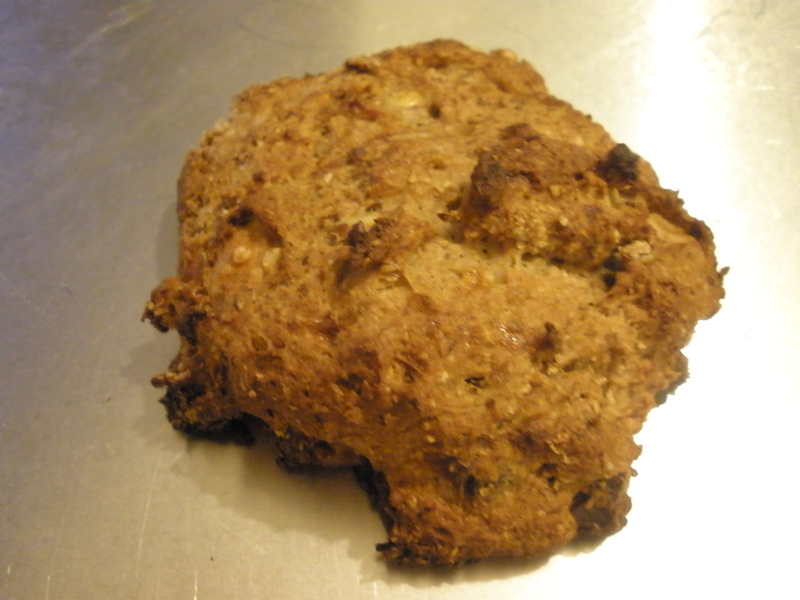 I used entirely white whole wheat flour, which you can usually substitute pretty well for white flour. I also used soy milk instead of rice milk. Other than that, I pretty closely followed the original recipe. Preheat your oven to 350 degrees F. Mash the bananas using a fork or a pastry blender. 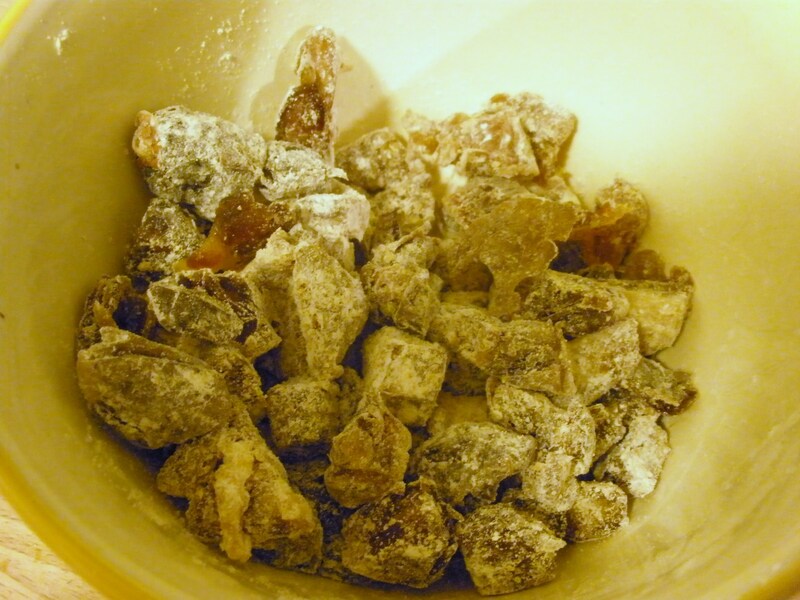 Chop the dates (watch out for the pits), and mix in a small bowl with 1 T flour to prevent the dates from sticking together. 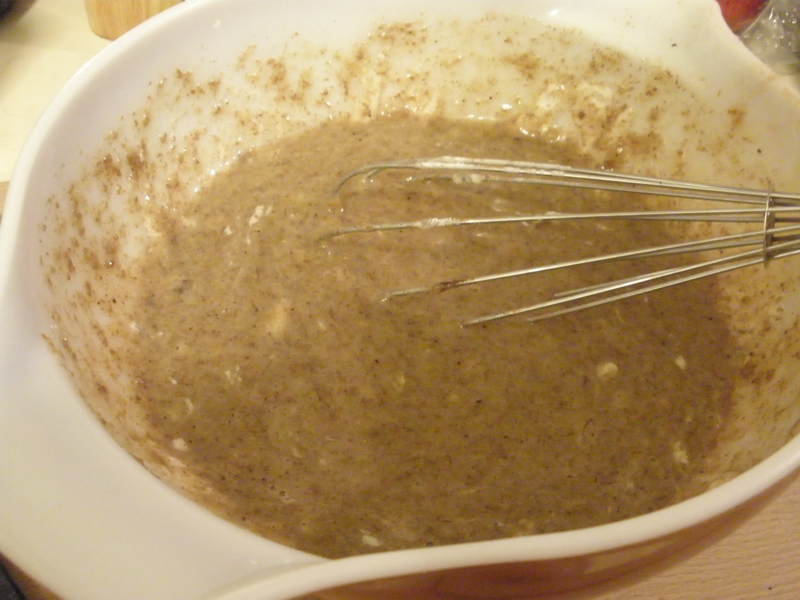 In a large mixing bowl, whisk together the flax seed with the soy or rice milk. Then, add in the mashed banana, canola oil, and the brown rice syrup. Set aside. 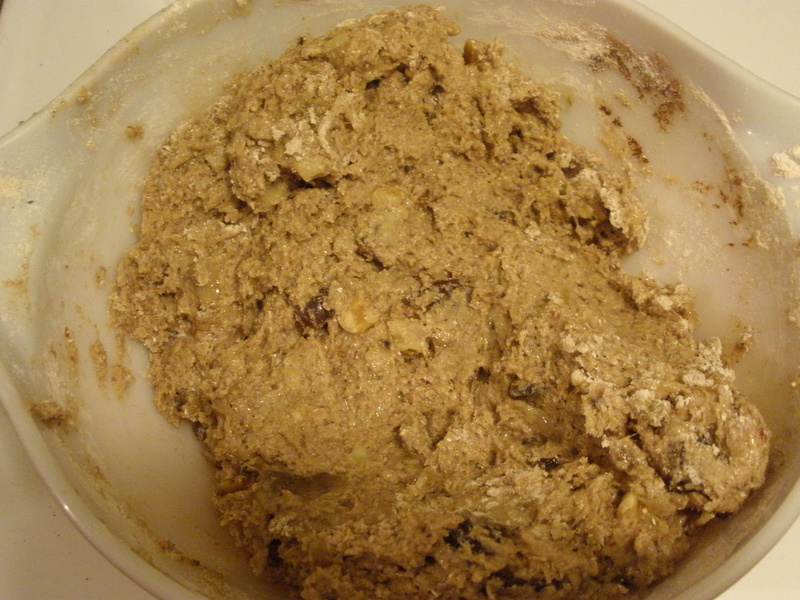 In a separate bowl, mix together the flour, baking soda, cinnamon, and nutmeg. Mix the flour mixture with the banana mixture. 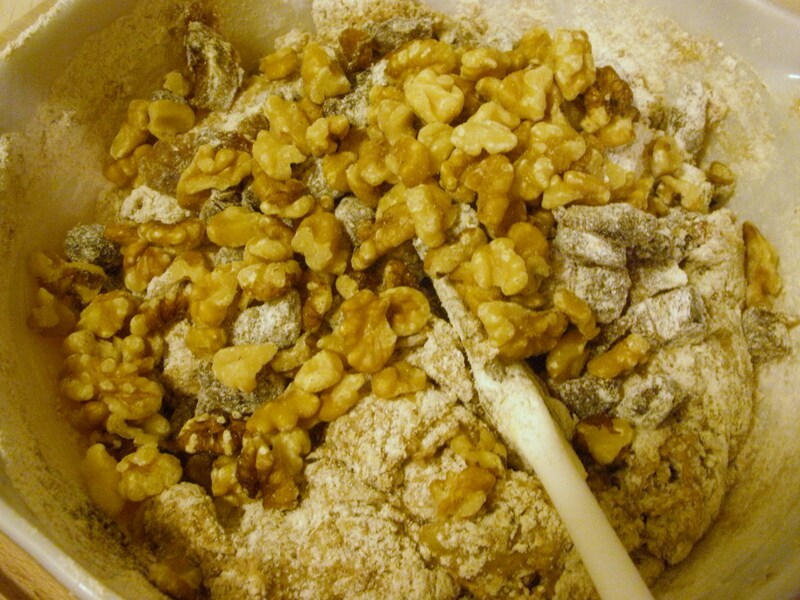 Then, fold in the dates and walnuts. Oil a 1/2 cup measuring cup. Get out a large cookie sheet. You can either spray or grease the cookie sheet to prevent sticking. 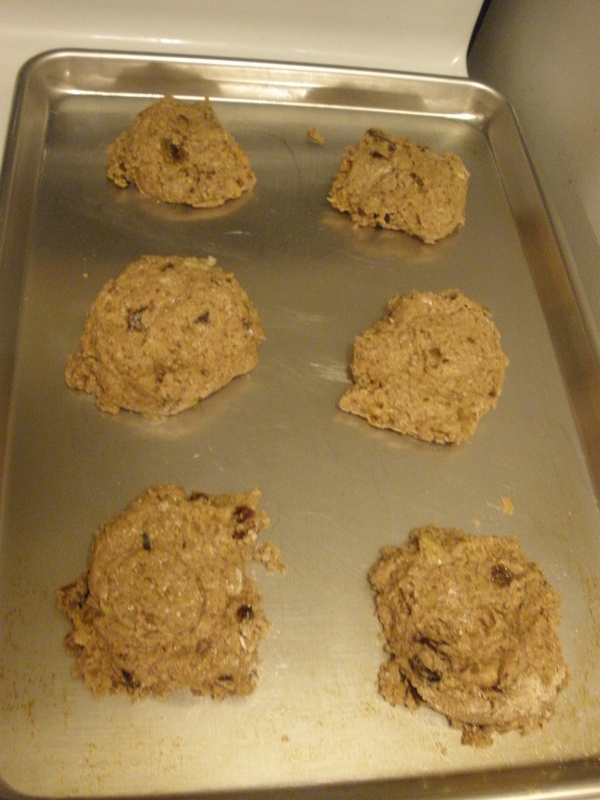 Scoop out dough using the measuring cup onto the cookie sheet, leaving around 3 inches between scones. Bake the scones for about 30 minutes. Because ovens differ, check on the scones after about 20 minutes. They should be browned on the outside.